*Hokadk47 has slaved the Fluffy Set here, so I recommend getting those meshes to save space in your downloads folder! 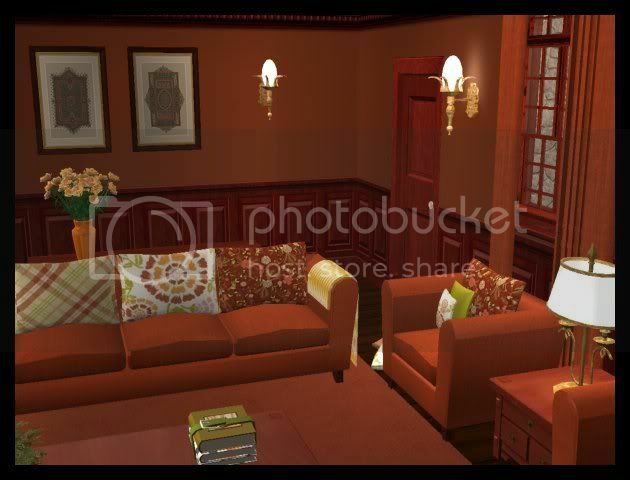 This features the great sofa and ottoman meshes by yggdrasil from the long-gone Spiffy Sims and the matching chair and loveseat meshes from Orange Mittens of Avalon (posted at Juniper Sun). These meshes are included in the "Clarimonde Meshes" zip. You may already have all needed meshes! More matching Clarimonde items found HERE. Paintings are by World Bazaar (EA NL Anonymous Masterpiece and base game Handle and Spout) and "White Amaryllis on Red" by Danui Nai (EA NL Reprint Serial). Inge's AutoDrapes from Simlogical made repository by HL here come in four prints as well as the solid shown (meshes NOT included). Steffor's French Bath table from Avalon (mesh included) and deco pillows from Parsimonious and CTNutmegger of Neighborhood99 (meshes included), and Dee's Elegant Decor (NOT included) complete the set. Thanks to all of those wonderful mesh creators! 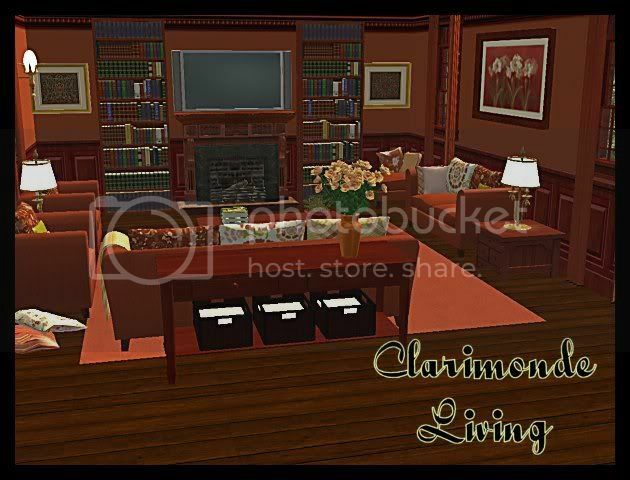 Deco not included but shown: lamps by Tarox, books by Steffor @ Avalon, bookcases and fireplace by Maxis, plants from Sims Design Avenue (formerly Caravan Shop Sims) Arcan set.